"Orders are prioritised on a first-come, first-served basis. 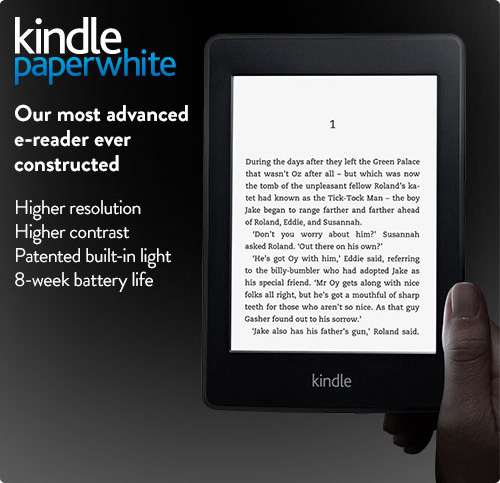 Kindle Paperwhite will be released on 25 October. Limit to two per customer.Dispatched from and sold by Amazon.co.uk." One of the biggest selling features about the Paperwhite is the "patented built-in light evenly illuminates the screen to provide the perfect reading experience in all lighting conditions". This light shines on to the screen (not out of the screen like a tablet) meaning easier reading. It can be dimmed or brightened depending on your requirements. Join our UK Facebook page (run by Denise) and US Facebook page (run by Danielle) for daily books and bargains for kindle, as well as tips and tricks for using them! The publishers decide if a book is lendable, not Amazon. Why not unlimited lending? Remember this is a bonus for prime membership which will be heavily promoted in UK now that the Kindle Fire is available there. Prime lets you borrow many movies and TV shows for free, but for years was primarily a type of account that got you free/ reduced shipping. So the book library is just a bonus. And remember, Amazon is a business, not a government-funded library - it's goal is to make money. Libraries typically don't. How do you enter comments when there are no buttons? A touch screen, or what? Yes, Al. It's touch screen and a virtual keyboard pops up. I will post a screenshot sometime soon.